1990 CD Card Birthday gift. 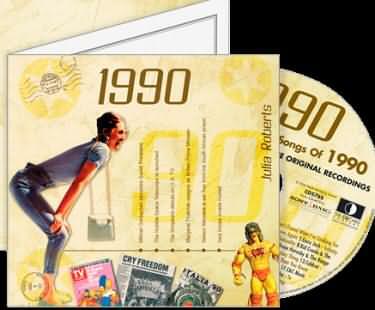 The two-fold card, together with the included 20-track compact disc featuring many of 1990's top artists and biggest hits, evokes a real sense of the year. You can listen to some of the great songs included with this CD Card below. Celebrate a year of birth, year of marriage or any other anniversary or special day with this ideal Card and Gift in one. 3. Lindy Layton - Silly Games. 5. Guru Josh - Infinity. 9. Taylor Dayne - I´ll Be Your Shelter. 10. Bruce Hornsby & The Range - Across The River. 13. Coldcut - Find A Way. 15. Martika - More Than You Know. 17. C&C Music Factory - Gonna Make You Sweat. 18. Terence Trent DArby - To Know Someone Deeply. 19. New Kids On The Block - Step By Step.